Politicians have described the Ring of Fire as a “game changer”, a “multi-generational economic opportunity” and “the most promising mining opportunity Canada has seen in a century.” In fact, a recent report by the Ontario Chamber of Commerce (OCC) corroborates these optimistic claims and has described it as an “unparalleled opportunity for Ontario to diversify its economy, and solidify its place as a global mining leader.” Yet, despite all this grandstanding on the importance of unleashing the Ring of Fire, very little has actually been accomplished. The Ring of Fire is a mineral-rich area in the James Bay lowlands – an extremely remote region of Northern Ontario. In 2008, significant deposits of copper, zinc, nickel, platinum, vanadium, gold, and — most importantly — chromite were discovered. Chromite is a rare and important input in the production of stainless steel, and the Ring of Fire is its only known source in North America. These chromite deposits are substantial; with the discovery, Canadian deposits immediately jumped to the fourth largest in the world. Of the various minerals discovered in Ontario’s Ring of Fire, chromite in particular is a highly sought after mineral. The market for stainless steel is growing, particularly in China and other rapidly industrializing Asian-Pacific countries. In addition, the United States buys 15 per cent of the world’s chromite, yet is without any domestic production. An increasing global demand for stainless steel, and by extension chromite, creates a unique opportunity for Ontario to mine and export the mineral in return for substantial economic benefit. Ontario also has considerable advantages over other major chromite exporters, which could help contribute to a successful industry. A survey of major players suggested that Ontario’s economic, regulatory and political stability provided a comparative advantage over other major chromite mining jurisdictions, such as South Africa, India, Kazakhstan, Russia and Turkey. Ontario stands to gain significantly from developing the Ring of Fire and exporting chromite. An economic analysis conducted by the OCC has estimated that within 10 years, the Ring of Fire could generate up to $9.4 Billion in GDP, sustain up to 5500 jobs annually, and generate nearly $2 Billion in government revenue; further projections contend that within 25 years, it would generate over $25 billion in GDP, $6.7 billion in government revenue, and significant spillover benefits to other industries across Ontario. For example, the OCC projects that in the long term, the Ring of Fire will generate up to $2.7 billion for the financial services sector, $1.2 billion for the retail sector, $600 million for the manufacturing sector, and $500 million for the utilities sector. This could be a huge – and arguably, much needed — boon to the long-term economic development of Northern Ontario, Aboriginal communities in the North, the province at large, and even Canada as a whole. So if the opportunity is so great, why has mining not begun? The most significant barrier is a lack of infrastructure in Ontario’s North. The Ring of Fire is currently virtually inaccessible, located over 330 km away from the nearest highway. There is also a lack of energy infrastructure in place to power large-scale mining operations. New highways, power lines, and even railways will be needed to make mining possible, and it has been estimated that this new infrastructure will cost $1.74 billion. But while this is an expensive investment, it would seem to be rather cost-effective when compared to the predicted impact of exporting chromite on the Ontario economy. However, despite strong political commitments to develop the region, the provincial and federal governments have been gridlocked in finding a way to fund the necessary infrastructure. 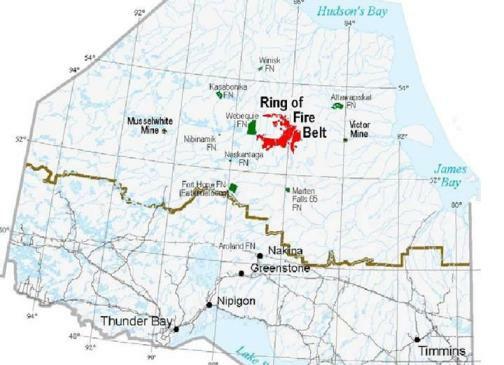 Ontario has pledged $1 billion to develop infrastructure for the Ring of Fire and has called on the federal government to match its contribution. The federal government has so far been hesitant to do so, claiming that this infrastructure should come from the $2.7 billion that Ontario is entitled to under the new Building Canada Fund – a fund that Ontario has not yet taken advantage of. Ontario has rejected using its portion of the Building Canada Fund to fund Ring of Fire development, contending it would leave very little funding for other provincial infrastructure needs (such as transit and roadways). Its government has recently submitted a bid for the matching infrastructure funding from the Building Canada Fund, but from the currently unallocated national infrastructure fund — not the $2.7 billion earmarked for the province. Ontario has said they will fund development by itself if need be, but successful development seems unlikely without federal assistance. Related to this delay is a second major problem that needs to be addressed: that of First Nations concerns. The Ring of Fire is located near many First Nations reserves in Northern Ontario, and there is widespread concern among First Nations about a lack of consultation over environmental assessment and infrastructure development with both governments and industry. These individuals want to ensure that their communities will share in the economic benefits of developing the Ring of Fire. They argue that conditions on-reserve – such health care, education, and skills training — have to improve in order for First Nations people to be able to take advantage of the economic development that the Ring of Fire will bring. Negotiations between the Matawa First Nations and the Government of Ontario are currently ongoing. Until these disputes are settled and the proper infrastructure is built, development of the Ring of Fire cannot proceed. Yet despite these delays, this particular project remains a tremendous opportunity to create jobs and develop a region that suffers from under-development and high levels of poverty. The Government of Ontario needs to find a way to work with the federal government, industry, and First Nations to find a solution to these problems that works for everyone involved. Connor Colvin is a 2016 Master of Public Policy candidate at the School of Public Policy and Governance, University of Toronto. He previously completed an Honours Bachelor of Arts in Economics at McMaster University. Connor is interested in a broad range of policy issues, but his main areas of interest include economic and social policy.